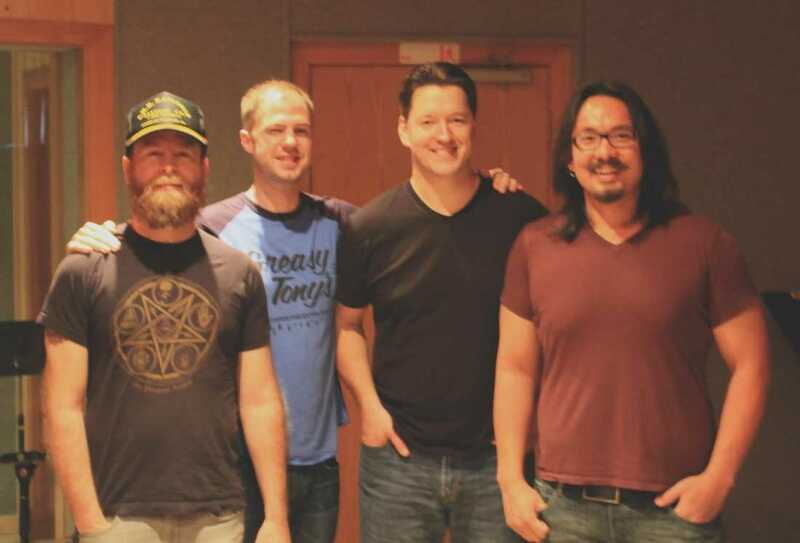 Producer Mike Garcia (far right) and the Oil Boom guys (from left to right: Steve Steward, Ryan Taylor, and Dugan Connors) pause at Fort Worth Sound, where Oil Boom recently recorded six songs. Gritty Dallas/Fort Worth bluesmen Oil Boom haven’t been playing out much, but they’ll be coming back Thursday with a bang. Along with Austin psyche-rockers The Boxing Lesson, Oil Boom will open a show at Lola’s Saloon (2736 W. 6th St., 817-877-0666) for Little Barrie, a grungy blues trio from England whose members bear some pretty rich pedigrees –– guitarist Barrie Cadogan has played with Morrissey, Johnny Marr, and Primal Scream, and the band’s new album, King of the Waves, was produced by (and includes contributions from) English pop music icon Edwyn Collins. The swamp-bluesy Little Barrie and the hard-and-trippy Boxing Lesson will go well with Oil Boom, even though the North Texas trio’s sound has changed somewhat. Boom bassist Steve Steward (EPIC RUINS, Kevin Aldridge & The Appraisers) said the “obvious Black Keys influence of the old Oil Boom stuff” has been replaced on new songs by “a late-’60s pop sound with blues-based rock” –– Steward and his bandmates, guitarist/vocalist Ryan Taylor and drummer Duggan Connors, recently finished recording six songs with producer Mike Garcia at Fort Worth Sound. Steward said he and his bandmates haven’t decided whether to release the tracks as an EP or record more for an album. Additional songs, he said, will be recorded either with Garcia at Fort Worth Sound or with Barry Eaton at his studio, The Swamp, in Justin. (The Swamp, a.k.a. 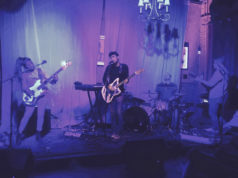 Electric Barryland, is where Steward and EPIC RUINS co-songwriter Jordan Richardson recently produced the highly anticipated debut album by Fort Worth space-rockers Skeleton Coast.) There are quite a few reasons why Oil Boom hasn’t been playing out much –– over the past year, original singer Brian Whitten left, Taylor took over vocal duties, and Steward joined. “But now we’ve been playing nearly an album’s worth of new material, kind of reintroducing ourselves with as many shows as we can play,” Steward said. Oil Boom plans to embark on a short tour through Tulsa, Oklahoma City, and St. Louis next month but will not lose sight of building a fanbase in North Texas. Cover to the Lola’s show is $8-12. … Bring your lawn chairs and/or blankets and friends to Magnolia Green Park (1100 block of Lipscomb between Rosedale and West Magnolia) on Friday for another installment of Friday on the Green. Three of Fort Worth’s grooviest acts are slated to perform: Josh Weathers & The True+Endeavors, The Apache 5, and Foxtrot Uniform. Admission, of course, is free. For more information, call the Weekly offices at 817-321-9700. 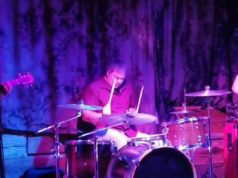 … Neptune Locals aren’t going to blow anyone away with their brand of funkified, reggae-tinged barroom rock, but the Fort Worth trio’s musicianship is solid and ideas spiced nicely. 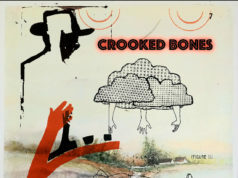 The band dropped a sweet little EP not too long ago and has been gigging pretty steadily. Catch Neptune Locals with Fort Worth ska-punk rockers Sally Majestic and Dallas’ The Effinays on Friday at The Aardvark (2905 W. Berry St., 817-926-7814) and on Saturday with no-nonsense rock deliverers Bum Lucky and the fusion-happy Arlingtonian mini-orchestra Mix Magyk at Rack Daddy’s (2301 N. Collins St., Arlington, 817-461-1420).